At what point can you say you have learned something? Is it when you can do it or when you can do something? Is it when you can explain it or when you are able to share it? Our new BC Ed Plan is creating a paradigm shift in how we assess our learners. Learner Self-assessment is the cornerstone to this paradigm shift. Teachers now have to teach learners how to self assess and create a classroom environment that supports each learner as they navigate through this change. Leaners need to be engaged in the process of self-assessment continuously all year long. It cannot just happen at the end of the year as an add-on. Kelli Vlogstad (KV), in her blog, “Teaching and Learning with Heart”, outlines three keys for teachers that will set learners up for success in this new reality of learner self-assessment. Our Teachers do this by making sure learners feel prized and cared for and that learners have a sense of belonging in an inclusive learning environment. Our Teachers help students build caring relationships with each other and with the teacher. Our teachers do this by providing opportunities for children to direct their own learning through play, inquiry, exploration, and discovery. Our Teachers engage students in the process of understanding the competencies and connecting them to their lived experiences in ways that are authentic, personal, and meaningful to them. Our Teachers are bringing the core competencies to life, helping students talk about and connect their understanding, their experiences, and their learning activities to these competencies. Our Teachers do this by modeling learning and demonstrating competence from their own experiences. Our Teachers take time to notice, name, and connect the core competencies to the activities, experience, and learning that take place around them. They engage students in on going self-reflections, and inviting students to reflect on and share what they think and feel about their learning. When the conditions are right, all learners can move to honest, thoughtful, and meaningful self-assessments. It really isn’t about the activity or form, and definitely not the checklist; it is instead about learners taking ownership and making meaning of the process, connecting what they do, what they know, and what they feel and understand about the core competencies and how they see themselves inside these competencies. Last week, our Grade 6 team took our entire Grade 6 community (94 learners and 29 parents along with 7 staff members) on a 3-day/2-night adventure to Camp Kawkawa, located in Hope. The primary focus of the trip is community building. The camp allowed us to do a variety of activities, such as: archery, hiking, swimming, kayaking, surf bike riding, canoeing, team building, boulder climbing, skits, and human foosball. It was a great opportunity to get to meet the Grade 6 class and learn a little about each learner. We were forced to be together 24/7, which allowed us the opportunity to show each other kindness, concern, care and patience. Living together, or being in community, is beautiful and life giving, but as you know, it is not always easy to do. It requires constant effort and daily mutual forgiveness, however, the safety and acceptance that develops from these habits and choices is invaluable! Take time this week to ask your child, “What attitudes or things discourage community?” Possible answers might be: cliques, selfishness, not being hospitable, anger, etc. These are all things we want to keep away from school. Also, “How can we be intentional about building a positive and safe community at LCS?” Our teachers are regularly talking and thinking about how to do this better, you can speak into this important topic by continuing this conversation at home. I love this quote from Jean Vanier: “Community is established by the simple, gentle concern that people show each other every day. It is made of the small gestures, all the services and sacrifices which say ‘I love you’ and ‘I’m happy to be with you.” To me, this embodies my deepest hope for our middle school. Hebrews 10:24-25 calls us to spur one another on toward love and good deeds, and to not give up on meeting together. Christ calls us to be “community builders”, so let’s be intentional about building a community where everyone feels that they belong. This week I had the opportunity to watch some of our Grade 7 learners work with robotics. Our middle school has purchased a class set of the robotic toy called Sphero. The Sphero Sprk+ is an amazing device. The Students are able to interact with Sphero using an App they download on a device. For us here in the middle school, we have classroom iPads that have the App loaded on them. Mr. Bell, tipped his classroom tables on their side and set up an arena for the 7 Spheros to be placed inside. He then asked students to set up an obstacle course using skipping ropes, cones, and bowling pins. 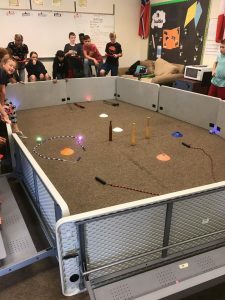 His instructions to the groups of students was to enter code to make your Sphero go around the obstacles without touching any and park themselves in a circle he made out of a skipping rope. Mr. Bell added one more rule which was that the first person in the group entered code until the Sphero touched and obstacle then the iPad was passed to the next group member so each member got a turn to code and work the robots. Our new BC Education Plan includes the area of Applied Design, Skills and Technology. Our middle school will be creating an exploration in each grade level to work with these robot toys and expose students to coding. We are excited to be engaged in 21st Century learning like this. Our School has a sister school relationship with a school located in the northeastern part of South Africa. Our schools have hosted cultural exchange trips with each other since 2006. The school is called Gondolikehethwa Christian School (GCS) and it is in town of Dzanani (located half way between Louis Trichardt and Thohoyandou). I had the privilege of chaperoning the trip this year. We took 6 students, 4 from Grade 11 and 2 from Grade 12. The trip involved living in homestays, teaching students, making friendships and experiencing life in South Africa. As a side mission, we took our technology coordinator to install Wi-Fi access points to permit teachers Internet access in their classrooms. You cannot go on a trip like this and not come home changed. My respect and admiration for the South African people has increased immensely. We are about 24 years post Apartheid and it is amazing to see the progress and great strides already made in their lives. Young people are graduating from Universities and now entering the work force. School aged students are very focused on learning, excelling in their test scores, after school tutoring, and making it to post secondary education to attain a career. Progress in the condition of homes and standard of living is increasing. Water and food are in good supply; on the other hand, jobs for unskilled labour are not in great abundance. There is still a level of poverty that is apparent as you walk and live in the community. Living with homestays for 12 days allowed us a window into the daily life of South Africa. Differences we had to become accustomed to included: different housing structures, different foods cooked for us, different creatures greeting you in your room, different customs and routines. Homes there have walls around the properties, gates to close and lock for the night. I was constantly aware of the threat of someone breaking into the homes to steal things. I have a greater appreciation for our homes and neighbourhoods that do not face threats like this on a daily basis. During my stay there, the significance of us being at Gondolikhethwa Christian School became more lucid. It is important for the community to see GCS reaching out past South Africa to welcome and promote relationships in Canada. Every two years, 8-10 Whites appear in an all black community. The whole community knows that we are from Canada and that we are staying at GCS. We become the focus of attention that everyone wants to touch us, talk to us, and learn about us. Our visiting elevates GCS in their community as a school that is making a difference and is extending its borders. Next spring we will welcome students and teachers from GCS into our community and give them a great cultural learning experience. Authenticity- to have credit for original works. If you have it uploaded onto the Internet, future searches will link to your site and will supply a proof of ownership to the material. Real work with a real need for a real audience, students need to feel a sense of worth in contributing to the greater mass of information our world is curating. Genesis 1, God made man in his own image. But, man sinned and created the flaw in the fabric of life. Since that sin, life has flaws and those flaws have multiplied and expanded in size and complexity. I am quoting it to establish my authenticity of it and to have it accessible amongst the mass of information on the Internet. In 1830, a man by the name of Quetelet (Kettle-Lay) pursued a study into the possibility of developing a science for managing society. Quetelet was a Royal Astronomer of Belgium, and was caught in a revolution of political upheaval that derailed his career and the building of his personal observatory. He longed for a stable government that would pass sensible laws and policies that would prevent the sort of social chaos that was prevalent in Europe at that time. After spending a lifetime finding hidden patterns in the mysterious whirl of the celestial heavens, he would apply the methods of Astronomy to study people. By 1840 Quetelet published his findings and claimed that everyone of us is a flawed copy of some kind of cosmic template for human beings. He dubbed this template “The Average Man”. But for Quetelet this average was seen as the ideal; the perfect score; size or shape man can be. It was about 10 years later that Francis Galton would disagree with Quetelet’s concept of the average and for Galton, the average was to be mediocre, crude and undistinguished. We all know who won that argument beause 167 years later we still hold onto the Galton concept of average! 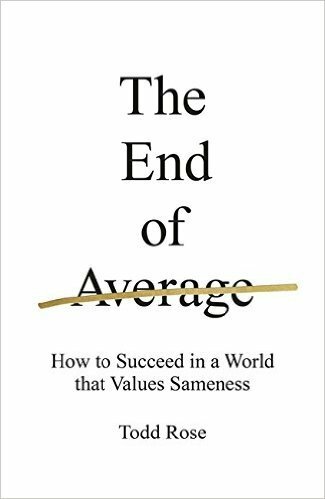 A great read is Todd Rose’s new book “The End of Average”. In it, he attempts to break our minds out of “averagarianism”. He implores us to understand each person as an individual. He gives three principles of individuality: the jaggedness principle, the context principle, and the pathways principle. These principles help you understand what is unique about you, and show you how to take full advantage of your individuality. I love his quote: “we need the tools to understand each person as an individual, not as a data point on a bell curve”. As our education program in BC is changing, so to are our assessment strategies. As teachers we need to see students as the unique individuals God has created each of them to be. Parents receive timely, ongoing feedback about their child’s learning throughout the year. At the end of the school year, or if a child moves, parents will receive a final written summative report that meets the requirements outlined for summative reports. Communications with parents may be provided in a variety of ways: in person; through telephone, email, text, Skype, and other electronic means; and through the use of reporting applications (e.g., Freshgrade, MyEdBC). Specific performance (proficiency) scales can be used as an alternative to letter grades. The different levels of performance should be clearly explained to parents. Districts can determine in local policy how letter grades are provided to students in Grades 4–9. District policy may determine different procedures for different grades. Letter grades must be provided if parents request them. The final written summative report also includes the requirement for a student self-assessment of the Core Competencies (Communication, Thinking, and Personal and Social), completed with the support and guidance of the teacher when needed or appropriate. The Core Competencies underpin all provincial curricula and are relevant to the development of Educated Citizens. The process of self-assessment can build student ownership and voice, and give students increased responsibility for the acquisition of these competencies. Through self-assessment, students can set yearly learning goals and identify ways in which they will further acquire and develop increased skill and ability in these areas. As you read this you quickly realize reporting is going to look and sound different than what we have become accustom to. It is an exciting time for Education in BC. We have the opportunity to move out of a model of education that started during the Industrial Age and has not changed much since. As a school K-12 we will be working to develop a policy on assessment to parents. We will be hosting information meetings with parents so please come out and ask questions and give input into your sons or daughters education. 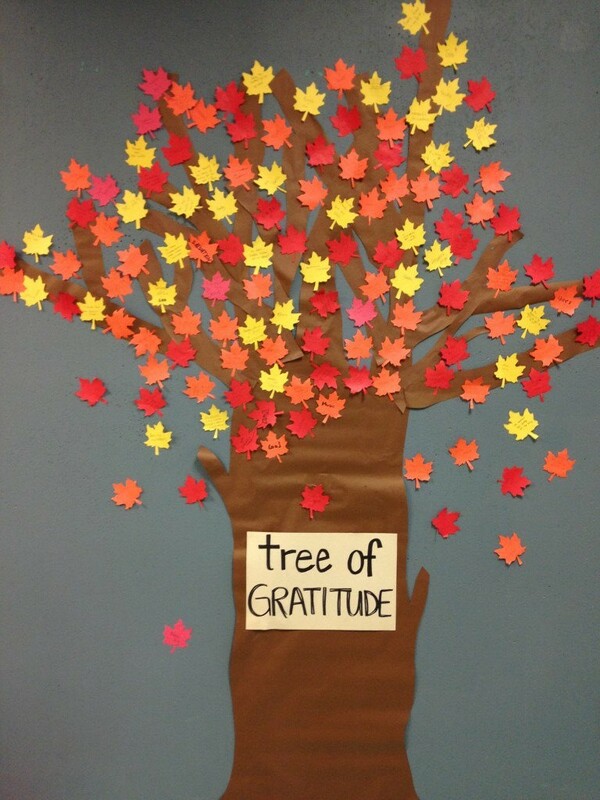 The Grade 8 class ended with students and staff taking a paper leaf and writing a message of thankfulness which they will stick to our “Tree of Gratitude”. The tree will grow as more leaves are attached. 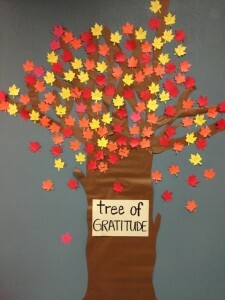 If you are in the school over the next week, find the tree and read some leaves! Our Grade 6 classes went away to Camp Kawkawa a few weeks ago for our annual retreat. The theme of the three-day camping trip was “Building Community”, and during scheduled devotion time, the students reflected on what the Bible tells us about community. They read in Acts 2 on the fellowship of believers and in Romans 12 on humble service. As well, they looked at what Philippians 2 teaches about humility, and in Ephesians 4 about unity and keeping the bond of peace. Finally, Hebrews 10 was sourced on how to build community in a Godly fashion. In his book “Building Community in Schools”, Thomas Sergiovanni writes that in building community, there are two motivational rules: The first rule is that what is rewarded gets done, and the second rule is what we value and believe to be good gets done. The first rule is an example of an extrinsic tie to a community where we remain tied to others and to the work as long as we continue to receive and value the rewards that someone else gives us. The second rule is an example of a moral tie to a community where we accept the morals, values and obligations we feel towards others and toward the work of the community. At LCS we are intentional at encouraging students to want to do things for the moral ties we experience through shared values and belief, and not to do things just for extrinsic rewards. We work hard to instill in our students that a servant heart is the foundation for building community. Having our parents help in the building of community is important. We need a strong parent community that supports our school, our teachers, and our administration. Together we can provide a positive environment for students to learn in. We are a story-formed people, and the teacher is the main storyteller in the educational setting. Our teachers are using Teaching for Transformation (TfT) to invite students into God’s story. TfT helps students discover the biblical narrative of creation, fall, redemption, and restoration. A phrase often used to describe Storyline in TfT is “see the story–live the story”. Storylines could include a classroom Storyline or a school wide Storyline that is used in lesson planning and unit planning. Storyline helps students discover how they can be co-creators with God in the present. TfT believes that every unit and every learning experience tells a story. The TfT program tries, using the story discovered in each unit of study, to create a powerful and compelling image of God’s story. The TfT program invites students to imagine his or her place in God’s story. The TfT program does this by connecting the story of each unit with opportunities to tangibly practice living the grand narrative. Each student and teacher will begin to create a personal “storyline” and articulate how they see themselves living in God’s epic drama. Our teachers have been training in TfT for the past year and we will be incorporating it into our upcoming year as we unpack the new BC learn plans for our classrooms. We are excited about this approach to learning and we know the students will be engaged in this learning model.